Thank You for those of you that have found a way to contribute some small amount! It Matters! By the end of this you are going to hate me or be happy that I as "User care." If you hate me that is fine, however what was raised in Donations "Last Year" basically extended a bad situation. What was raised was enough to keeps the Operations side going and a little was used in getting Enhanced to Seti and the MutiBeam Receiver in place. Whatever small reserve they had left which was never mentioned is gone... It is now the CRUNCH TIME! While I do not know how long we have the time left is short it is the $538,000 or bust! Just Operations for a years (Servers and Bandwidth and Administrators) is a quarter million dollars roughly $21,000.00/month. That is what keeps the Forums Open so Users can help other Users, and Others chat with old Friends, allows us to Crunch and have Races against our Friends or other teams (that you can't figure out how they got that far), It allows for discussions on what My Next Computer should Be. All in all we are a Large Extend Family, and a Family Member is in Need! IF You Can, Please Consider a Donation It is Very Important! Message 481599 - Posted: 13 Dec 2006, 18:19:41 UTC - in response to Message 481185. Please take a look at the budget. They need US$ 230,400 just for the current expenses, and so far people have donated about 60,000 US$ and this will cover only about 1/4 of the expenses. It's a question how long that will last. So, if you like to be a part of this project and/or AstroPulse/Beta, and you want them to continue, please consider a donation, how much you can afford, to keep this place going. First, I want to Thank Every One that has found a way and a few extra Dollars to Help Seti. I know that "WE" Can Do this! There is no easy way to say this... With the knowledge that I have, what has been raised to date will buy Seti sometime until the end of January or into February. I have been in communications with Seti Staff and told things that would be considered confidential. Then How do You (Seti) explain something like this. It is Not good news... I have privately raised (again) the PayPal issue and received some discussion. Things are being worked on but there is no quick answer (that answer could be about 3 months out). I have also asked for some information that could be approved for general discussion, about how bad the situation is. What I am saying is from what I have been told, no details. NO it is not easy or pretty. I can say that by looking that Old Budget and the New Budget many things happened... After having ran a Business know that income has to exceed outgo... What did not happen on the first Fundraising Drive is now about to bite us. The Folks at Seti are trying, but currently it is a losing battle, there are racing the clock. Teams Captains should let their respective Teams know that their Favorite Project is at Risk! There are some that are working on ways to help. What has been raised so far $61,760.46 Operations Costs are killing it (that is part of my precept)... So Programming aside or advances in Enhanced, Multibeam, Astropulse and the Near Time Persistency Checker (for all the data previously collected). It becomes someone reaches out and pulls the plug from the wall... Or in your home someone disconnects Your Internet! If by some odd chance 1 to 5 percent of the Seti users could come up with some cash then it would not be an issue. The more dollars in the short term buys time for the Long term. What I see is the same people keep giving... There are others out that have no knowledge of the problem. Communications and People Caring is what Solves Problems. I Care, many Here Care! Spread the Word that a Family Member needs Help! We all part of the First Distributed Computing Family! SETI, Seti needs Help! So as I have said more than I should have, I have not violated the trust that was shared. I can only say things are Very Grim for Seti! AS I have information I can share or facts that I can point to, and will be happy to do that. In the mean time it is up to each of "US" to find a way to get [/url=http://setiathome.berkeley.edu/donate.php]Donations[/url] to help Seti move on and evolve. Spread the Word! Seti needs Help! I find it simply amazing that only a little over 1% of the crunchers donate to SETI...imagine what just the minimum $10US could do if each and every person who crunches data were to donate...SETI would not have to worry about funds and bugets. I would challenge anyone who is truely serious about the SETI project and the other projects to Donate simple $10.00. Even 10% of us donating once a year would take care of the budget for operations. Imagine what SETI could do with 15-20% of us donating just $10US! Another thing to look at though, is how many people actually have the money to donate? Yes, I understand $10 dollars isn't much, however, that $10 dollars may have to pay for gas, food, a power bill, a credit card bill, whatever bill. For me, personally, I don't have the extra cash to donate. I've got bills that take up my money. If I could spare the extra cash, I would, but right now, with a family and 3 kids, its been kinda hard to make ends meet. I would hate to see this project go away due to lack of funds, but for me, what is more important is supporting my family and keeping a roof over my head. Currently $66845.46 has been raised, I know that many Holidays for Many Religions happen this month. I and Seti would never presume to take anything away from your Loved Ones. WE all know times get tough and making ends meet is tough. I would like to say Thank YOU! for what you have been able to provide. It is still a bit short of the goal, but we can do what we can do. "WE" can do this! If you can find a way to Send a Small Gift to Seti, countless Users will appreciate it. The larger percententage still has not idea that there is a problem. Letting others know that you you have helped to get started is Important! Maybe they can also Help... Spread the Word! From the Combined Budgets or the progress taht may be hard to see for some. The First Funding Drive got the MultiBeam Receiver and Data Recorder in place and working! Seti Beta really is only partly correct, it really is a mix of Alpha and Beta Testing. MultiBeam Data is in "Beta" Testing or part of "SETI@home II" however there is still additional Application Development that is needed. That would mean we have workunits to Crunch if the lights are still on. "A Little Birdie" told me that sometime In Jan we may see the first pass at Astropulse in Beta. What that really means is that Seti Beta Users will be doing the first Alpha testing of Astropulse. A Nameless Person that "we" will call Joe, is working to help insure that there is still Windows 9.x support (currently for Enhanced and Multibeam). Some Silly person that goes by the name of Pappa keeps digging this out and trying to help put things in perspective. The perspective is, unless Operational Costs are met they close the doors. While some development is still happening (Multibeam) it eats into operational costs. During a difficult time of the year for everyone (including myself, I have lost four machines to power issues). I am asking that IF, You can find a way to spare a few Dollars to support Seti then do so. I know several groups are working on ways to gather funding... That still takes time and effort and obstacles to overcome. How I count it what has been raised buy's us time into January solve some of the ways to get money to Seti. Message 485280 - Posted: 19 Dec 2006, 1:31:15 UTC - in response to Message 482651. Thank You for Your Concern and taking time to express it. Your Family Comes First! That is the Bottom Line! I also know that you are not alone. When I think of the First Donation Drive I beat up the Forums everyday, where ever I could interject a plea for donations it was there... Seti is "Still" in a money crunch, I can only try to point out what is not obvious... This time I have not been as forceful. As far as I know there has been no notice sent to the Crunchers email... So the audience is smaller making it tougher. Since the start of the Fund Drive $71048.00 has been raised hopefully that will keep things going until more ideas and ways of helping contributions can happen. One thing that I have forgotten to mention The Seti Store. While it is not as much to the advantage as a direct donation, everybit helps. A Little Birdie told me some Good News. At this point we are Good probably towards the end of February into March. To date You have Helped to raise $75326.15, this during a time of year where many are trying to take care of families and prepare for Holiday's. What I can say is that the PayPal issue is actively being worked, No there is no time frame yet. Quiet discussion has came up with a few ideas on how to best communicate with the users about the issues. Those ideas are still being worked on and nothing more will be said until they are ready. There will be a big push to Raise the Goal of $538000.00, that completes the project list. The Fund raising has to Happen! I know that it will have more organization. The future tends to hold that "WE" the users will keep things going for Seti. So At this point I will not be beating the various Forums about Donations, it does not mean we are totally out of the woods. "WE" have time to plan and make it work more effectively. Please remember that the Seti Store helps also. I send my Very Best Wishes during these Holidays. Thank You Everyone, for all the Help. Sounds Simple, but there are reasons. I would Love that you explain reasons why it is too tough to Donate! Those are Issues that need to be resolved. I Know that Family Comes First! Defining techincial issues that prevented you from making a donation is Important! Please take a moment to tell what you saw and why it stopped You. Then something might be done to help overcome those issues! Message 486332 - Posted: 20 Dec 2006, 18:48:18 UTC - in response to Message 485780. Yes, the same birdie chirped the same news to me, but all, please notice what Pappa here says, that "we are Good probably towards the end of February into March." This means that after this point, they need money just to run this place for! So, please make a donation as soon as you're able to. Of course we all know that December and the season for expenses is here, but please consider a donation as soon you're able to, as the projects else will be in dire straits. Thank you all, who have donated. And yes, we are taking some initiatives to raise more money. I had opened a Thread to see if there were some reasons "technical" that might be overcame. As a result of a person posting a question we have a response from Eric. It might be worthwhile to so to go take a look at This Thread it explains part of the battle and why several of us are very concerned. the hard part is getting the information out to everyone. Todate [25 Dec 2006 0:59:16 UTC] You have helped to raise $80041.15 or 14.9% of the goal. My Very Best Wishes to Everyone during the Holidays. Do you want to own a piece of SETI and help the cause? Visit the SETI@home Store. To an extent an interesting bump in Donations happened on Christmas Eve 15 people donated $1730.00 when I have been saying I hope that we meet $700.00 day for basic operations. I am sure that Seti, Thanks You for the Christmas Present. 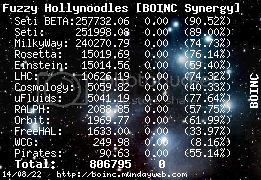 Todate [27 Dec 2006 1:00:00 UTC] $81166.15 has been raised or 15.1% of the goal all within about 4 weeks... So while progress is not Earth Shaking it is Progress. So, "We" Can Do This! For most part, it means I will not be beating up Donations. However Donations are Very Important, so you have about a week of rest. I am finding that a group of people do know and are finding ways to help keep Seti Alive... Applause! The Key to making the Goal is getting the word to Everyone! Yes, I and others know that not everyone has the money to help. With over 200,000+++ users if ten percent can be reached and can help it would mean that Seti should have no problems. SPREAD The Word, Seti Needs Help! Team Captains, Your teams need to know. Message 492290 - Posted: 28 Dec 2006, 17:08:02 UTC - in response to Message 492047. My best wishes to you and your wife! [2 Jan 2007 1:00:00 UTC] $85437.82 or 15.9% of the Goal. All of this in a little over 4 weeks. Nov and Dec Raised $85142.82 or about 15.8% of the Goal or operations into Mar. Eric had stated that a new application needs to be compiled to have MultiBeam in Seti Main (or run out of things to crunch). Astropulse should be ready for testing here in the next few weeks. I guess it'll be a race between this and getting our own non-profit corporation set up. We are currently experiencing database performance problems. This is resulting in erratic workunit downloads. Or roughly 190000 Active Users... So those that have donated are even more Important. I wish You all the Best of the New Year, I feel Good Things will Continue to Happen! Nov and Dec have brought in $88142.82. Including Jan $89317.82 or 16% of the Goal right now we are on a coast and rebuild mode and working on Information, PayPal, the Seti Non Profit Organization setup, MultiBeam to Seti Main before there are no more workunits to Crunch, Astropulse to Beta... This does not mention Eric is working on the Application that will need to be complied (it will be faster) to allow MultiBeam to move to Seti Main. And the Web Server is getting ready to collapse. So as information about problems with getting donations to Seti was posted and the responses are looked at... Then ways to overcome those issues non technical and technical are being looked at. I know that several people have volunteered to act as a PayPal Agent in the short term. There is discussion about how to accomplish that without creating mis-trust. Currently it will have to filter through UCB to get the Funds to Seti. SO it boils down to If You Can and When You Can Donations are needed. If you can not, I and Seti Understand, there are times in everyones Life they wish they Could but reality bites. So I will not disturb you for a couple more days. Seti Staff is working to get MultiBeam and the Seti Application ready for Seti Main. AV BEEN INVOL;VEWD WI SETI 4 TRHE PAST 20YRS ET ASNT SPOKE YET I STILL LIVE IN HOPE AS WE ALL DO.